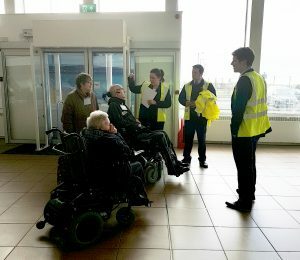 On Monday, 18 February 2019, Glasgow Prestwick Airport held its third annual host day for persons with reduced mobility, hidden and non-hidden disabilities. This event gives service users, support workers and charities the chance to visit the airport, experience the passenger journey and provide feedback on the airport service levels. 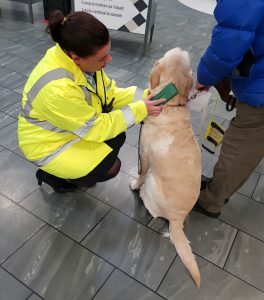 In association with the North Ayrshire Access Panel (NAAP), a group of visitors including Jasper the guide dog were met by our passenger assistance team. Our visitors from the NAAP were given a guided tour of the airport with a focus on how assistance is provided for our departing and arriving passengers and visitors. The tour began in the terminal building including a visit to check-in and our assistance areas. We then simulated how assistance is provided through Security Central Search and into the departure lounge. Next up was behind the scenes access to our stair free boarding Aviramps and Ambulift carriage vehicles as delivered by our ground services staff. The tour was completed with a full run through of the process for how we provide assistance to our arriving passengers including a tour of Passport Control and baggage collection areas.